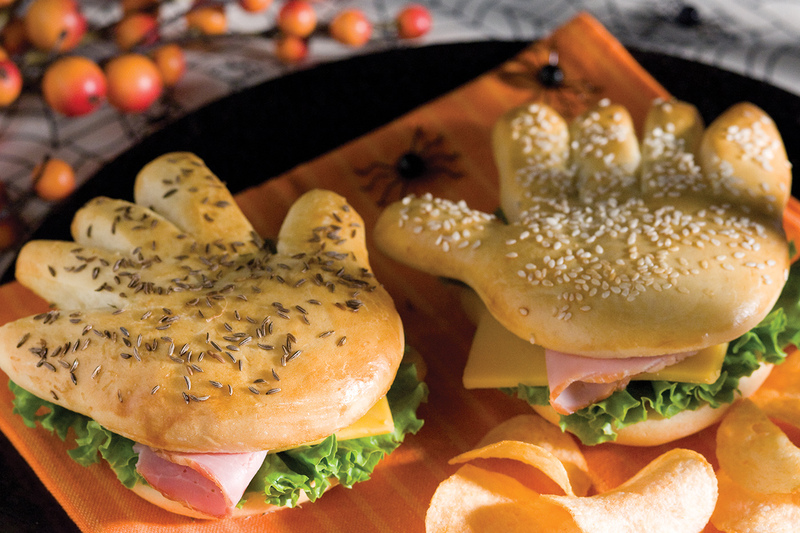 Give yourself a hand this Halloween night, by serving up sandwiches on these fun and easy Halloween Handwitches. Flatten one roll into a 4×5-inch rectangle. Make 4 equal cuts into one end for fingers, cutting the thumb strip 3/4 of the length of the dough and the finger strips 1/2 the length. Repeat steps for second hand making cuts opposite. Separate the fingers slightly. Pull the thumb strip off to the side and cut in half. Tuck the cut off piece under the palm and press into the dough. Place hands on a sprayed baking sheet. Brush with beaten egg and sprinkle with seeds if desired. Repeat with remaining rolls to make a total of 6 right hands and 6 left hands. Cover with sprayed plastic wrap and let rise 45 minutes or until almost double in size. Remove wrap and bake at 350 degrees F 15-20 minutes or until lightly browned. 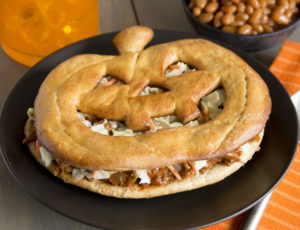 Use a right hand and a left hand to make a sandwich with the filling of your choice.